A short drive from one of our favourite places, Santo Stefano di Sessanio, is one of the oldest standing forts in Italy, the spectacular Rocca Calascio. This is the highest mountaintop fort in Italy (1460m above sea level). 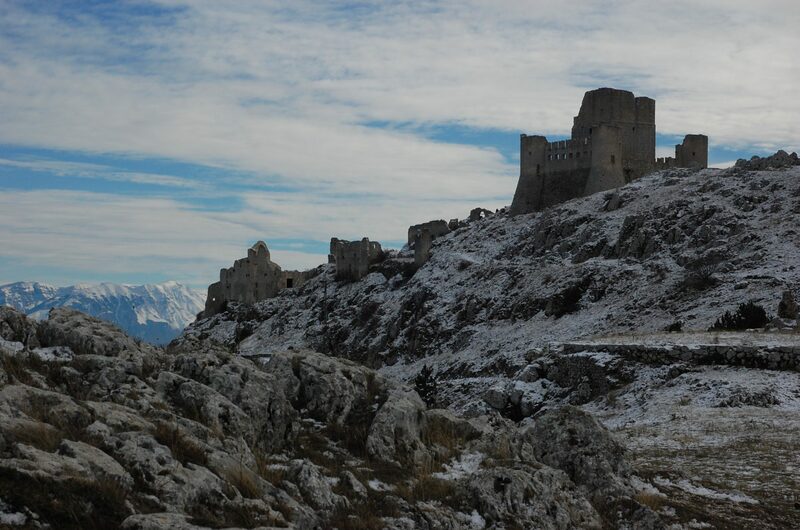 Rocca Calascio was initially built as a watchtower in the 10th century or earlier, the fortress developed in size and complexity over a period of time, particularly in the 14th century under Leonello de Acclozemora, and subsequently the Medici family in the late 16th century. Studies have shown that it would only ever have been designed, unusually, to accommodate a military garrison, rather than proffering shelter and protection to the local civilian population (perhaps partly explaining why it was one of the first sites of Peasant Revolt in 784!). An earthquake badly damaged the fort in 1703, after which it was left in its ruined state as it no longer served any strategic purpose. It is possible to park quite close to the fortress. However, it is far more enjoyable to use one of the earlier car parks and take one of the easy-to-follow tracks that wind their way up the hillside. 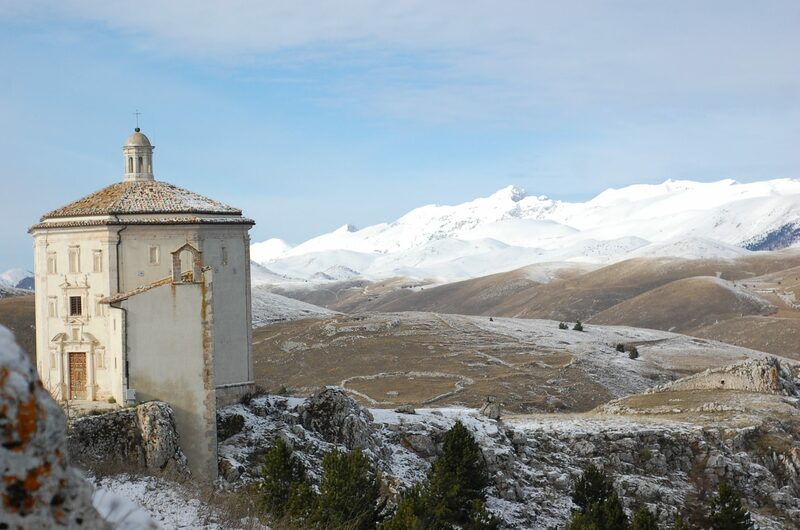 As with many of the rural dwellings in Abruzzo, Calascio suffered from the Depression in the 1950s & ’60s, but the village is, like Santo Stefano, now part of an impressive restoration project, with the assistance of the Abruzzo-Shire people for example. It also boasts a few cosy bars/cafes providing coffees, ice creams and the like for those weary from the exertions of the climb. From the village a winding path follows along the foot of the impressive fort, from where the use of the white limestone to build up the structure (with the larger stones at the base) can be clearly seen. This path reaches an apex at the 17th century octagonal church of Santa Maria della Pietà, possibly containing paintings by the one-time Calascio resident, artist Teofilo Patini (the church was alas closed upon our visit). Then onwards & upwards to the fort itself. Rock, limestone & skyscape combine to provide excellent photo-opportunities here. The most intact parts of the building are connected by a modern wooden drawbridge (not fun for those suffering from vertigo! ), and are cornered by four cylindrical towers, from which one can espy all that happens in the surrounding Navelli valley and the plain of Campo Imperatore. An easier climb/slide down, and we were soon back in the car, pleasantly knackered. A good day out, combining history, exercise, and, uhm, entomology…it must have been the first day of Spring for the number of Roller Dung Beatles that we saw out and about.